Forty-four children and 16 community volunteers participated in the 2nd Annual UNITE Chess Mini-Game© Tournament. 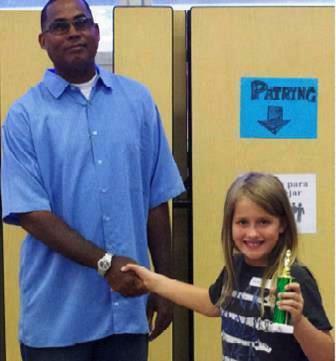 The event, held Saturday, September 21 at Mariposa Elementary School in Lancaster included six tournaments. 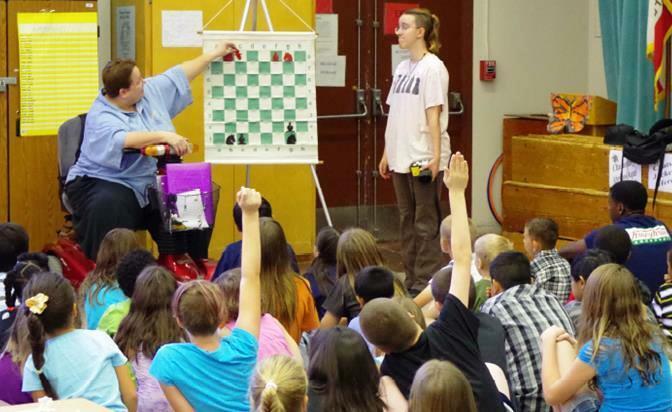 Daa and her daughter, Morgan, teach a Chess Mini-Game © to participants and community volunteers. The participants, most of whom knew nothing about chess before the event, learned how a chess piece moved then played a Chess Mini-Game© which uses that piece. After each piece and mini-game presentation, the group played in a tournament of that mini-game. This was repeated six times, once for each of the six kinds of chess pieces. After the six tournaments, Commissioner Stan Muhammad of the City of Lancaster’s Neighborhood Vitalization Commission presented each of the 16 volunteers with Appreciation Certificates. He also handed out a Participation Certificate to each child, ages 3 to 14, and then presented the trophies to the 14 winners. 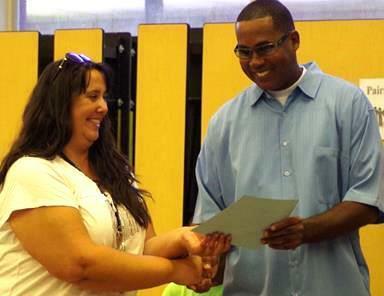 Stan Muhammad of Lancaster’s Neighborhood Vitalization Commission presented the volunteers with Appreciation Certificates. The AV Chess House’s non-profit arm, Say Yes to Chess, facilitated the event. Daa (pronounced day) Anne Mahowald (aka Ms. Daa) organized and ran the event. Her spouse, Matt Mahowald, and their 22-year old daughter, Morgan, were the other chess teachers for the event. A wide variety of research has established that the learning and playing of chess improves the Pattern Recognition skills necessary for both reading and math ability. Consequently, although the 44 children participating in this chess event were simply focused on having fun, their brains became better at learning reading and math! In addition, each family received a free tournament-standard chess set at the end of the event. Thus, they will be able to continue to improve their reading and math skills as they engage in the fun Chess Mini-Games© they learned during the event. Muhammad also handed out a Participation Certificate to each child, ages 3 to 14, and then presented the trophies to the 14 winners. 2nd Place Kings Cross, David Garcia Jr.
For more information on Say Yes Chess, contact Daa Mahowald at daa@mahowald.org or visit Chess4.us.